the program to reach children in Worldreader-affiliated schools as well as adults in libraries. Tad talks about his Author Ambassador experiences in his first blog post, The Power of Reading to Kids: “I am not a researcher, scientist, academic or someone who has gathered empirical evidence about the value of reading to children, but I’ve seen first-hand how a book or story can introduce children to a world they’ve never seen, a concept that has never occurred to them, or a life they haven’t lived. I’ve seen books bring people together and as I have visited classrooms in the United States and throughout the world, most recently in Ghana and Kenya with Worldreader, I’m always amazed at how stories can connect people.” Tad’s 5-day Author Ambassador journey featured visits to the Kibera School for Girls (Kibera, Kenya), St. Mary’s Boarding School (Narok, Kenya), Kade School (Accra, Ghana) and Dordiak Educational Complex (Accra, Ghana). The trip was captured documentary-style and is presented in a Worldreader blog post today and can be viewed on the Penguin Random House YouTube channel. 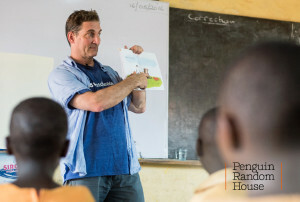 https://youtu.be/aQT1CFr3-I0 Penguin Random House and Worldreader proudly partner to help create a world where everyone is a reader. Visit www.worldreader.org and www.penguinrandomhouse.com to learn more about how we are committed to creating the next generation of readers around the world.